‘Victory Vehicles’ is the only entirely war-themed Goofy short (although the end of ‘How to be a Sailor’ (1944) refers to the war, too). It’s no army cartoon, however. Instead, the cartoon parodies propagandistic shorts of the time, using a patriotic voice over and dealing with the (real) problem of rubber shortage. ‘Victory Vehicles’ introduces various silly inventions that should replace the car as a form of transportation. The solution finally settles on the pogo-stick: “the answer to a nation’s needs”. ‘Victory Vehicles’ is a very enjoyable cartoon in its silly satire. It’s also a nice window to the shortage problems of World War II America. The film contains a very catchy theme song called ‘Hop on your Pogo Stick’, and a short cameo by Pluto. 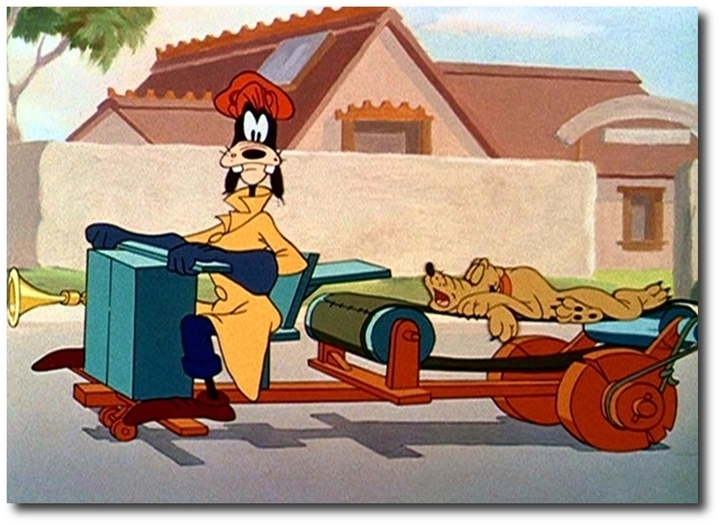 ‘Victory Vehicles’ is an important landmark in the Goofy series, because it marks Goofy’s graduation from single character to the prototypical everyman. In this short various types of Goofies can be seen, including women and children. They are provided with different voice overs, emphasizing that every Goofy we see is a different one. Of all evolutions of a cartoon star, this is the most remarkable one. The thirties Goof, with his all too recognizable character traits has been transformed into an everyman who could be anybody, and, at the same time, still be Goofy. Other directors would return to the original Goofy in cartoons like ‘Foul Hunting‘ (Jack Hannah, 1947) and ‘The Big Wash‘ (Clyde Geronimi, 1948), but Jack Kinney would stick to the everyman Goofy, making the most hilarious cartoons with this character.